The majestic moose is a beautiful animal to behold- especially on a plate with a side of mash! Tracking a bull moose is an awsome experience for any hunter. 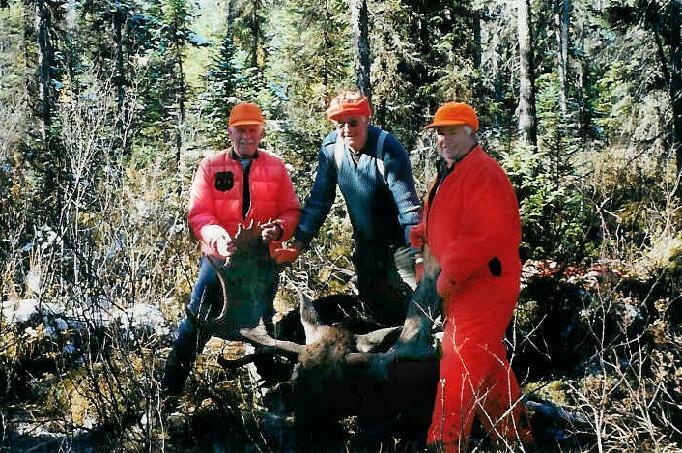 Archery hunters in Ontario are permitted to hunt Moose during the prime-rutting period which generally occurs in Northern Ontario from mid-September to early October. During this time a skilled guide can call in a bull moose and you can expect �up close and personal� encounters. See our Guiding Services page for details. The rifle season usually begins in mid October. Hunting the call can still be effective during this period but you can also plan for some spot and stalk experiences by land and by water. This has been a popular method of hunting at Poplar Ridge Lodge as a boat, motor and gas are supplied as well as live bait should you wish to fish while stalking your moose. During the gun season be prepared for all 4 Seasons as you might experience them at any time during October in northern Ontario. A solid (no pattern) Blaze orange vest is required along with a blaze orange hat to make up the minimum requirement of orange to be displayed during hunting season. Bow hunters during the Archery Season are not required to wear orange while hunting but should have it available for travel to hunting areas, and for tracking. Dark camouflage patterns are preferable and a mask or face covering should be included. Rubber or otherwise waterproof boots are essential for your comfort during many hunting situations as well as a pair of comfortable walking/hunting boots. Click for complete rules on hunters orange. The moose has a rather thick hide on large dense bone structure. For this reason broadhead penetration capabilities are paramount. 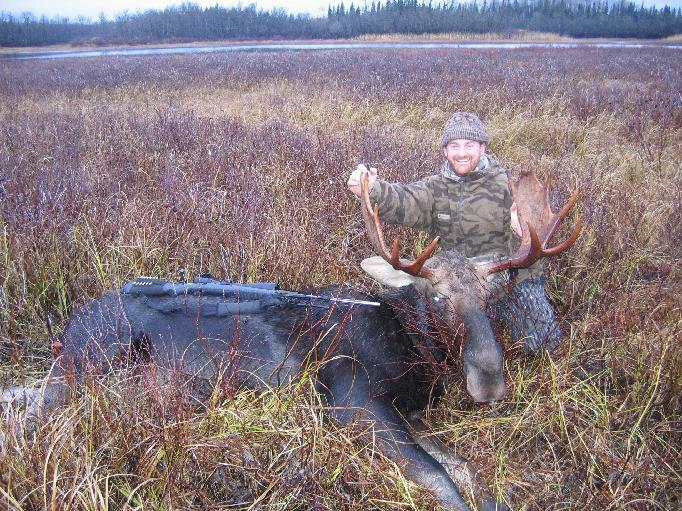 We would suggest that no broadhead of less than 100 grains should be used for moose. 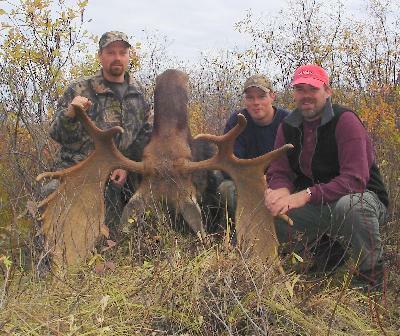 We discourage the use of any type of mechanical or expanding broadhead for a moose hunt. Several manufacturers have been contacted and are hesitant to strongly endorse the use of their mechanical products on a moose. Obviously a well-placed shot is the key but we want you to be best equipped for a quick and humane kill. A rifle caliber of not less than .270 is recommended with a 165+ grain bullet. A good hunting/skinning knife, compass, GPS, game bags, first aid kit, survival kit, cover scent, scent eliminators, flashlight, binoculars. Our non-resident bull moose hunt has become extrememly popular and therefore needs to be booked at least a year in advance. Please email for availability.